Should sugarbeet farmers apply micronutrients and secondary macronutrients? It’s often suggested that soil is more likely to be deficient in secondary macronutrients and micronutrients, which are required to achieve maximum productivity. 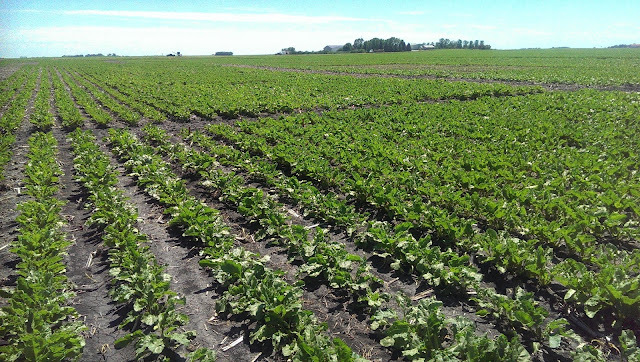 Current guidelines for sugarbeets in the northern and southern growing regions of Minnesota do not recommend application of secondary macronutrients, like sulfur, or micronutrients, like boron, copper, iron, manganese, and zinc. Although research has historically not demonstrated a benefit from application of these nutrients, there is still a push to apply them. A positive response to sulfur application in corn has led to questions about whether other crops could benefit as well. Sugarbeet response to sulfur has been studied over the past ten years with no benefit in tonnage or quality found for high clay soils with high organic matter. A response on very sandy irrigated soils is possible; however, it is not likely because most irrigation wells contain water with sulfate sulfur. It is unlikely any changes will be made to current sugarbeet guidelines suggesting sulfur be applied on a widespread basis. It has been reported that sugarbeets are sensitive to both boron and manganese deficiency. Guidelines for the application of boron and manganese to sugarbeet do exist in some areas of the U.S., but these nutrients have not been shown to benefit sugarbeets grown in Minnesota. A trial was conducted to determine if sugarbeets grown in soil with high organic matter benefit from boron application. Seven locations were studied in both the northern and southern growing regions. The trial found no increase in root yield or sugar quality from two, four or six pounds of boron broadcast to the soil surface at planting. In very sandy soils, it is possible that boron is deficient, but boron should be applied at a low rate of two pounds or less on a trial basis because over-application of boron could reduce yield due to toxicity concerns. The most common micronutrient deficiency in Minnesota is zinc, but zinc deficiency is more likely for crops grown following sugarbeets. Sugarbeets can affect crops like corn due to poor colonization of corn roots by mycorrhizae. Mycorrhizal colonization of corn roots aid in the uptake of zinc. Sugarbeet is a mycorrhizal non-host crop which can reduce early colonization of plant roots the following year, and results in what is called “fallow syndrome.” To help reduce fallow syndrome issues in corn grown after sugarbeets, a band application of phosphorus and zinc can be beneficial. Rising crop yield levels does not mean you need more secondary macronutrients or micronutrients. Focusing on base fertility practices that have been shown to enhance yield is still the best way to ensure greater profitability in years with low to moderate commodity prices.